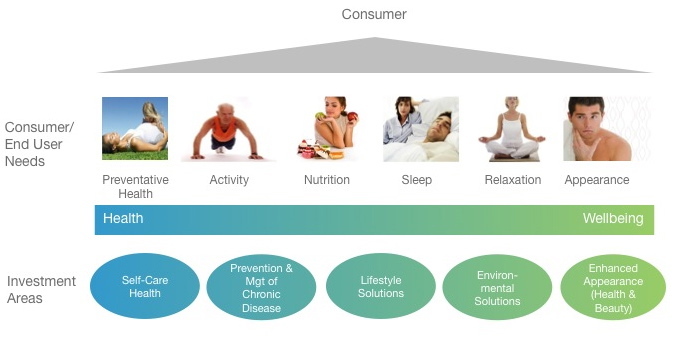 Our investment focus is on consumer centric health & wellbeing solutions and can be clustered into the following themes. Examples of propositions per theme are listed below, all driven by an end user need. Self-Care Health: co-created systems, information and decision support and integrated care approaches. Prevention and Management of Chronic Disease: activity, nutrition, sleep, stress, monitoring, behavior change, metabolic health and functional foods. Lifecycle Solutions: monitoring, care giving, reproductive health, cognitive fitness, balance and mental sustainment. Environmental Solutions: sanitation, air, water and food. Enhanced Appearance: targeted approaches, non invasive alternatives, integrated systems, aesthetics, professional to home use and disease prevention.